This Bride Just Sprinkled Some *Magic Dust* On Our Instagram Feeds! The best part about being a wedding writer is that you get to sit and look at pretty pictures of happy brides all day long. And while all the brides I come across, both virtually and in real life, look super pretty because of the sheer happiness they are experiencing, there are some brides who literally make my heart skip a beat. They do something different and unique which sends me into an 'I want this at my wedding too...' mode. The pretty bride Ayushi is one of them. 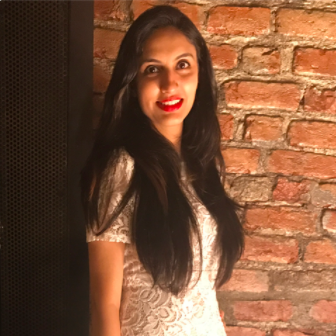 Ritika Kadam is one hairstylist who knows what she's doing. I am in love with Ayushi's braided hairdo. Another smart decision by the hairstylist was to use hair accessories in place of real flowers as they tend to wilt away in the hot and humid weather. Ayushi's outfit and hair together give a very boho vibe. Another thing that adds to the vibe is her makeup. Kept minimal and dewy by her makeup artist Shradha, the 'highlight' of Ayushi's makeup was her on-point highlighter. The face glitter did wonders to her look! Her eyes were done up with a bold eyeliner and lash extensions, and a little blush accompanied by a coral pink lipstick was all it took to give this bride the perfect finishing touch. 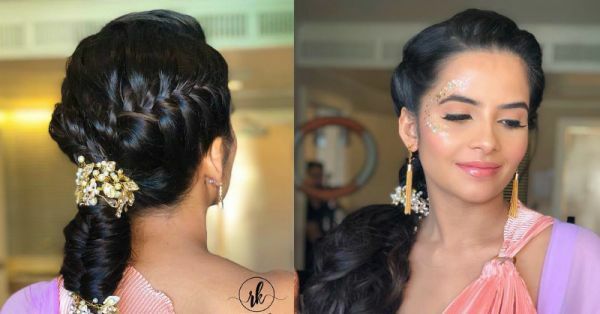 I don't know who I'm getting married to or when, but I am sure I will opt for this amazing hairstyle for my mehendi function!